Italian Renaissance master Lorenzo Lotto was born in Venice around 1480 but spent most of his long career working in provincial towns. Perhaps this is why he is not as well known as Giorgione and Titian, both of whom were born outside of Venice but did most of their work there. 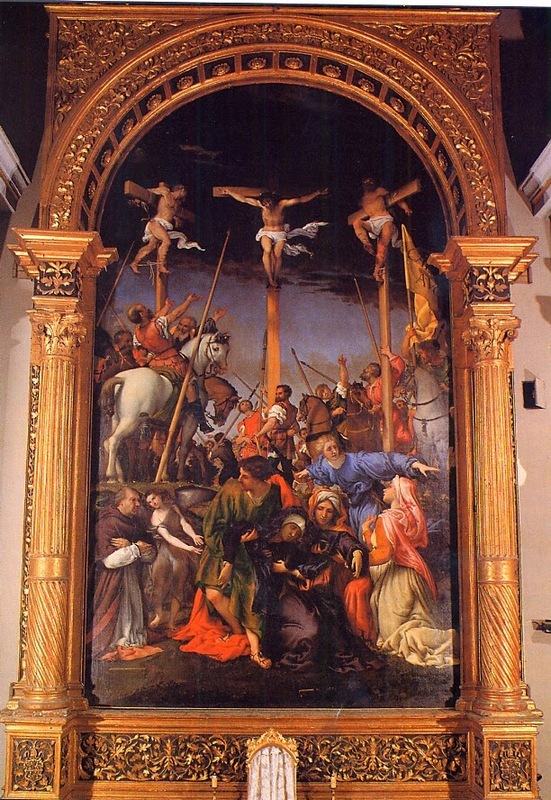 Lotto’s most powerful and dramatic work was a Crucifixion* that still stands in its original site in the little church of Santa Maria in Telusiano in the small out of the way hill town of Monte San Giusto in the Marche. It is not too far from Loreto, the religious center where Lotto eventually spent the last years of his life. Lotto’s Crucifixion shows that he could hold his own with the greatest of Renaissance masters. My wife and I saw the painting a few years ago as we traveled down the Adriatic coast. Our old guidebook described it as the "most dramatic and powerful" of all Lottos's large scale works, and so we decided to take a side trip out of our way in hope of finding it. Although we are very thankful for the wonderful works of art preserved today in Italian museums, it is always special to see a work “in situ”, where it was originally meant to be seen. It was not easy to find Santa Maria in Telusiano and we finally had to go into a local bank where a patron kindly offered to lead us there through the curvy narrow streets of the town. We parked outside a long stone staircase that went up and up between stone buildings packed closely together on each side. It was hard to immediately recognize the church but we finally found a door that led into what was no more than a large chapel. It was dark inside and the church was empty except for a couple of ladies who seemed to be cleaning. We could hardly see the painting behind the only altar but one of the ladies pointed to a little box. We put a coin in and immediately the great magnificent painting (450x250cm) that took up almost the whole back wall was revealed. Revealed is an understatement. The light, color, movement, physicality, and dramatic intensity virtually jumped out at us. In the foreground, the disciple John seems to lead the grieving blessed Mother right out of the picture. Behind them red-haired Mary Magdalene dressed in blue stretches out her arms in grief. A crowd of guards and onlookers stand beneath and around the three crosses that reach high into a dark sky. Jesus is in the middle flanked by the two thieves. The death of Jesus is also marked by a great wind that causes cloths that cover him and the thieves to billow. The same wind causes the Roman banner on the right to unfurl and reveal the first letters of the name of Caesar Augustus. The disciple John leads the Mother of Jesus away from the scene of horror. Today, it is hard to imagine what churchgoers back in an obscure provincial town must have thought when they beheld this magnificent painting. They could never have seen anything like it before and must have known that a great master had been in their midst. Going to Mass in Santa Maria in Telusiano would never be the same. At the Consecration, as the priest at the altar raised high the consecrated host, their eyes would also behold the sacrificial victim raised high on Calvary in the dramatic and breathtaking altarpiece behind. *Lorenzo Lotto: Crucifixion, 1531. Santa Maria in Telusiano, Monte San Giusto, Macerata, Marche. (oil on wood, 450x250 cm). See detail below. When Vasari calls Morto “melancholy”, he does not necessarily mean sad or depressed. Melancholia was one of the famous four humors Renaissance humanists believed formed the essence of any human being. Although all these humors were present in every individual, one would inevitably be prominent. So a person could be characterized as sanguine, choleric, phlegmatic or melancholic. 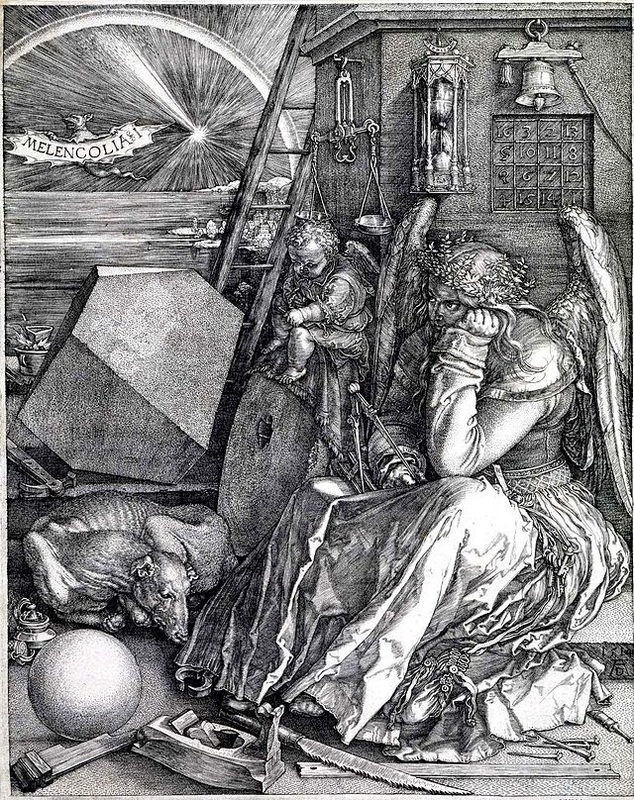 In his long study of Albrecht Durer’s famous engraving of Melencholia, Erwin Panofsky noted that melancholy had come to be regarded as the characteristic of most great men. 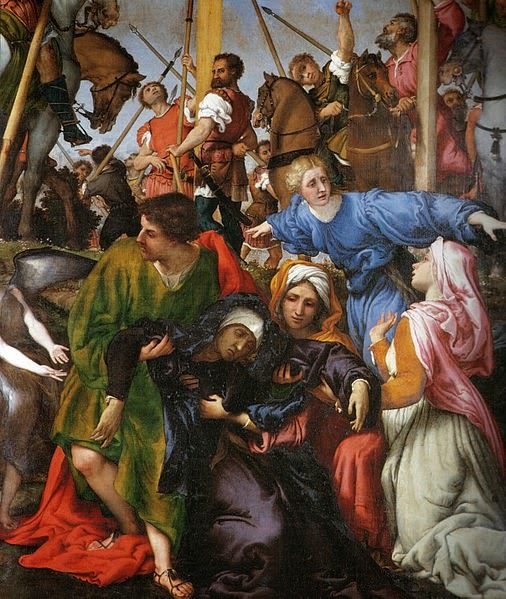 Like many of the artists that Vasari wrote about, Morto has largely been forgotten. Their biographies are often overlooked and even omitted in shortened editions of the “Lives of the Painters.” Nevertheless, Vasari placed Morto on a very high plane and credited him for his studies of the images in ancient Roman caves and grottoes. Morto used this knowledge of the grotesque to become a master of ornamental decorative art. During the Renaissance grotesque also had a different meaning than it does today. It did not mean ugly or hideous but just referred to the kinds of images found in these newly rediscovered grottoes. 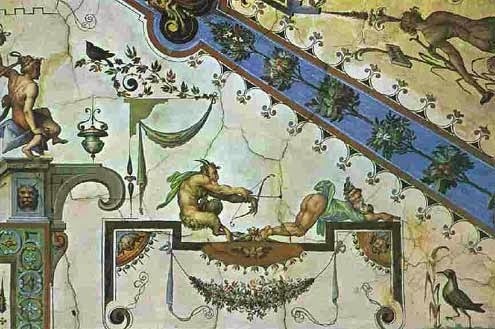 As Vasari points out, Morto used these strange devices to decorate or trim the walls of modern buildings. I suspect that Morto did not go to Venice by accident but that he was called there by Giorgione to assist in the decoration of the walls of the Fondaco dei Tedeschi. Giorgione would do the figures but leave the decorative elements to Morto. Vasari indicates that like most Renaissance craftsmen, Morto did aspire to do traditional subjects but quickly realized that he could not match the work of Leonardo or Raphael. 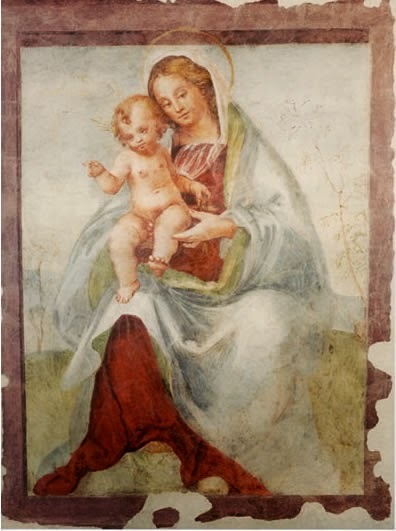 Nevertheless, Vasari notes that he did try his hand at some Madonnas. He might have even been inspired by Giorgione while working together on the Fondaco dei Tedeschi. 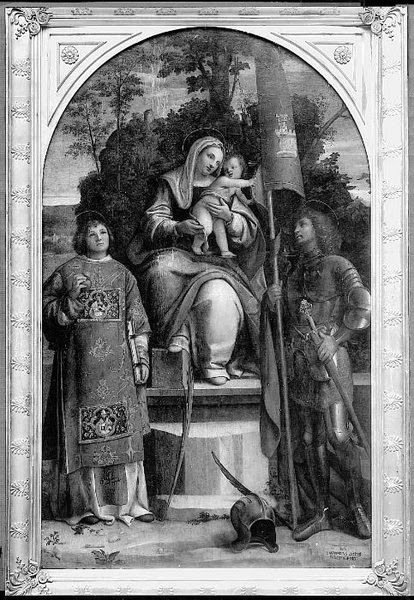 Below is a Madonna and Child that does look Giorgionesque. 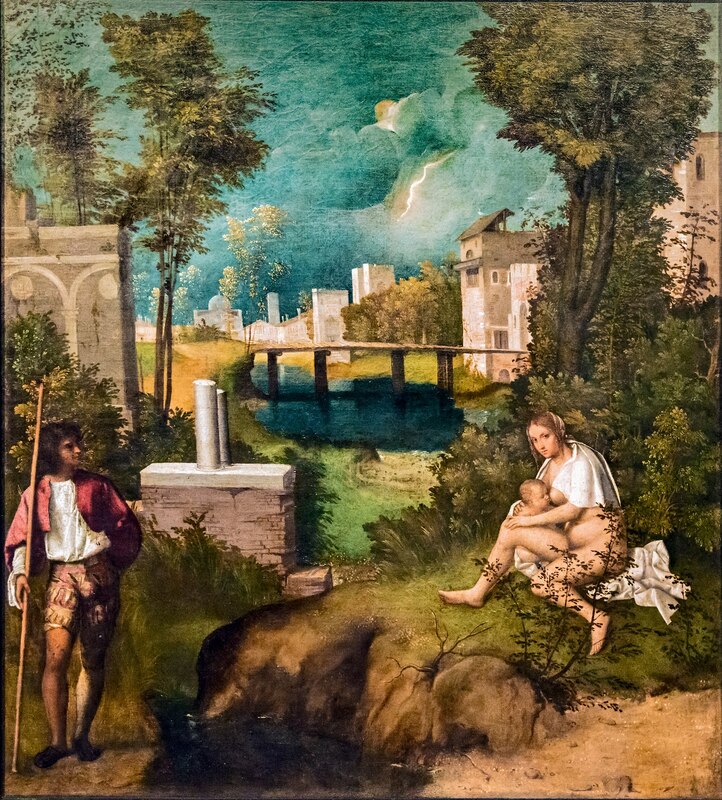 In his history of Italian painting during the Cinquecento S. J. Freedberg discussed a painting done by Morto shortly after Giorgione’s death in 1510. Morto came to a sad end. Perhaps his melancholic nature led him to give up painting and seek fame as a soldier in the service of Venice. Without any military experience he was hired as a captain of a 200-man contingent but died in a skirmish outside of Zara in Sclavonia in 1524. ** Erwin Panofsky, The Life and Art of Albrecht Durer, Princeton, fourth edition, 1955, p. 165. *** S. J. Freedberg: Painting in Italy, 1500-1600, Yale, third edition 1993, first published 1971, pp. 164-5.